We provide initial project development and scoping for evaluating existing buildings and mechanical systems and lighting systems. A.L.M. Consulting Engineers, Inc. uses Carrier Hourly Analysis Program E20-II and Energy Pro for heating and cooling load calculations and energy analysis. A.L.M. Consulting Engineers, Inc. has also developed their own energy analysis program for analyzing energy usage for mechanical systems. We specialize in measuring and analyzing energy usage for existing buildings mechanical systems and lighting systems. A.L.M. 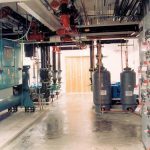 Consulting Engineers, Inc. has an inventory of data loggers, poly phase recording power meters, air flow hood, hydronic pressure gauges, air pressure gauges and other measuring and metering devices to determine mechanical system performance and energy use. We also employ the technical personnel capable of installing these devices and provide mechanical system evaluations, including, but not limited to; servicing and repairing of mechanical systems. We provide incentive procurement for federal, state, and local utility programs. This includes preparation of all required documentation, base-line development, energy analysis and measurement and verification. In order to reduce or shift energy usage during peak periods, our demand response analysis can chart the path for incentive procurement. California’s Title 24 Building Energy Efficiency Program gets updated every three years and we stay on top of the changing requirements. Our project management covers all updates needed for energy analysis and documentation.